Performance Time: Approximately 60 minutes, 48 pgs. CHILDREN’S MUSICAL. Annie, a young green-winged macaw, is eagerly awaiting her first flight. But before the big event, Annie’s parents go to the river to gather some nuts for breakfast. While they are gone, loggers cut down all of the trees, including the macaw’s home. 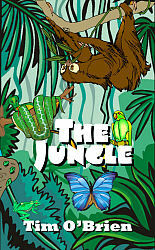 Annie escapes to another part of the rainforest but gets lost and cannot find her way home. As Annie searches for her parents, she meets a tree sloth, a pair of singing tree frogs, leaf-cutter ants, and a beautiful Morpho butterfly. With the help of the jungle creatures, Annie is able to summon her courage and continue her journey home. But on her way, Annie must escape the talons of Ego the eagle and the jaws of Con the boa constrictor. This charming musical features irresistible characters, richly entertaining songs, and a fun way for children to learn about rainforest ecology and conservation.